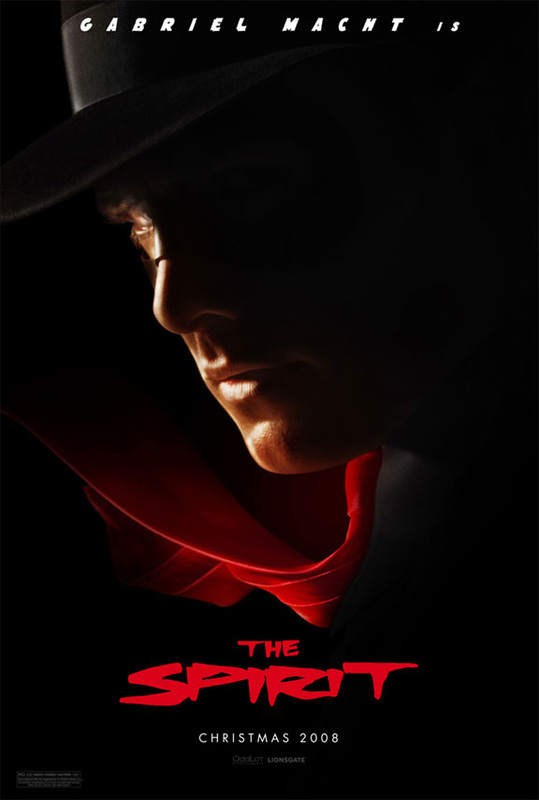 The Spirit, an action-adventure-romance, is the story of a former rookie cop who returns mysteriously from the dead as the Spirit (Gabriel Macht) to fight crime from the shadows of Central City. His arch-enemy, the Octopus (Samuel L. Jackson) has a different mission: he's going to devastate the Spirit's beloved city as he pursues his own version of immortality. The Spirit tracks this cold-hearted killer from Central City's rundown warehouses, to the damp catacombs, to the windswept waterfront ... all the while facing a bevy of beautiful women who either want to seduce, love or kill our masked crusader. The Spirit is a fictional American masked crime-fighter, created by writer-artist Will Eisner in 1940. The Spirit chronicled the adventures of a masked vigilante who fought crime with the blessing of the city's police commissioner Dolan, an old friend. Despite the Spirit's origin as a detective named Denny Colt, his real identity was virtually unmentioned again and for all intents and purposes he was simply "The Spirit". The stories ranged through a wide variety of styles, from straightforward crime drama and noir to lighthearted adventure, from mystery and horror to comedy and love stories, often with hybrid elements that twisted genre and expectations. The Spirit Movie Prop Peplicas, Figures, Toys and Collectibles! 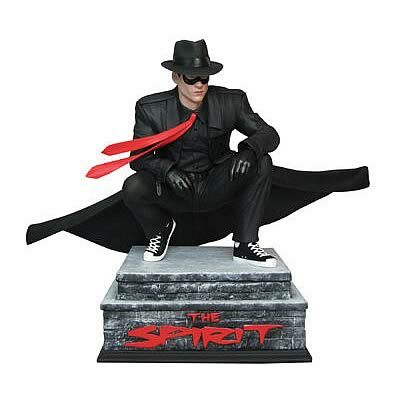 The Spirit Statue presents the masked avenger in full figure, 1:7 scale size. Peering over a winter rooftop of central city, The Spirit is poised and ready to spring! Sculpted by Kolby Jukes. Measures approximately 11-inches wide x 7-inches long x 8 1/2-inches tall. Limited to 750 pieces worldwide! Hot Toys! Here's a superb collectible action doll of the femme fatale Silken Floss from the 2008 "The Spirit" movie! Standing 31cm tall, the figure features an accurate head sculpt of actress Scarlett Johansson as Silken Floss and utilizing Hot Toys' incredible action body with gorgeous rooted blonde hair and over 30 points of articulation. The costume is painstakingly recreated to be faithful to the film, complete with military suit, shirt, jodhpurs and boots. Silken Floss comes packed with a removable hat, pair of glasses, belt, necklace, armband and syringe. A figure stand with nameplate is included. Mezco Toyz NEW 2009 The Spirit Movie Action Figure “Plaster Of Paris” The 7 Inch Plaster Of Paris Action Figure Includes Short Sword & Alternate Hand Accessories! Mezco presents The Spirit Movie Action Figures, based on the big budget film written and directed by genre-twister Frank Miller and based on the classic comic by comics grandmaster Will Eisner! Mezco Toyz NEW 2009 The Spirit Movie Action Figure “SAND SAREF” The Sand Saref 7 Inch Action Figure Includes A Pistol & Trunk Acessories Mezco presents The Spirit Movie Action Figures, based on the big budget film written and directed by genre-twister Frank Miller and based on the classic comic by comics grandmaster Will Eisner! An ambitious and formerly eager young cop killed on the job, who under mysterious circumstances is reborn as a masked crimefighter with an eye for the ladies. Determined to still keep his beloved city safe, he works with Central City's police force from the shadows. A femme fatale secretary and perversely innocent accomplice to the Octopus, only slightly more sane than he is. The Spirit's childhood sweetheart, who perennially seduces and marries wealthy men, has them killed, and uses their money to fund criminal exploits in a constant pursuit of a life of the highest luxury and influence over the criminal underworld. She is also a tragic anti-heroine, with her policeman father accidentally murdered, causing her to have a hatred of police and Central City, and break up with aspiring cop Denny Colt. The police commissioner's daughter and a top surgeon who considers it her duty as the Spirit's current flame to keep him healthy and alive. A former coroner turned psychotic supervillain who plans to bring all of Central City to its knees and will kill without discretion anyone unlucky enough to stand in his way.